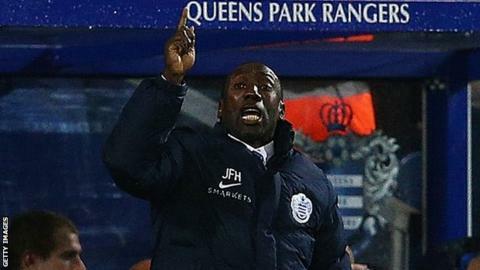 Jimmy Floyd Hasselbaink has been sacked as manager of Championship side Queens Park Rangers. The Dutchman, 44, was appointed in December last year but won only 13 of his 47 matches in charge. Hasselbaink left QPR after a 1-1 draw with Nottingham Forest on Saturday, which leaves them 17th in the table and six points above the relegation zone. The club said an announcement about its managerial situation "will be made in due course". Former Tottenham and Aston Villa boss Tim Sherwood had been linked with the job prior to Hasselbaink's departure. The ex-Chelsea and Leeds striker had come under pressure following a run of just two wins since August. But despite QPR's poor form, they trail sixth-placed Leeds by only six points in a tightly packed league table. Last month, Hasselbaink was filmed as part of a Daily Telegraph investigation alleging corruption in football, apparently negotiating a fee to travel to Singapore to speak to a fake Far East firm. QPR stood by the former Burton boss, saying a lack of evidence from the newspaper ended their investigation.